Imbolc hasn't been a spoke on the Wheel of the Year that I typically resonate with much. Snow is still on the ground here in the Northwest and temps are staying fairly steady, so the "spring is coming" aspect of Imbolc isn't happening yet. However, recently I was chatting with my dear friend Annwyn Avalon about a health issue of mine and she suggested a ritual to the Celtic goddess Brigid for assistance. Imbolc was a week and half away; how fortuitous! My husband works with Brigid so I am familiar with Her energy though She is not one I talk to often. 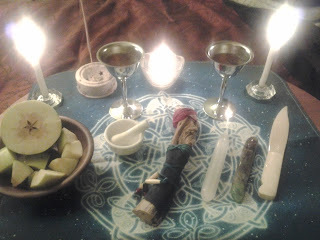 My altar for the ritual was very simple. (I do have a larger permanent altar to The Morrigan.) The table is just a laptop table I use for my computer when I'm lounging in bed. There are hand-dipped candles by yours truly under the supervision of The Water Witch, 3 for the Triple Aspect; gorgeous altar cloth by the talented Brigid Ashwood and in particular, my etheric healing tool- the sage root wand in the center- was part of my training by Gretchen Smith-Thermer, originally of the 12 Ray Spiritual Mystery School. The crystal wands were there to be charged with healing energy and the bone athame in recognition that occasionally healing means to cut away the diseased part. This is also true for emotional healing and the release of negative energies. During my meditation I received the directions and information for the process of healing that I needed. I also pulled a single Tarot card for additional insight. The facet of Her energy I called upon is very gentle and soothing. At the end of the ritual the apple pieces went to the deer that frequent our yard and a cup of the juice (I didn't have milk on hand) to a tree. Pleased with the results I relaxed for the rest of the evening. Now is the "fun" part- following the directions! Typically I'm the type who wants to get things done when it comes to my health but I had been dragging my feet. However, I am aware that this is part of my journey this time around and that the more I experience, the better I am able to relate to others. I am grateful to Brigid for being clear and concise which is certainly not a common circumstance from the Gods. Reach out, whether to a deity or a friend, for the encouragement and empowerment to manifest a stronger life for yourself. Be aware that sometimes it is necessary to remove something that holds you back. Just for today, each time you take a sip of water, tea, or milk, imagine Her healing energy being absorbed into you and see how it feels at the end of the day.